We’d love your help. 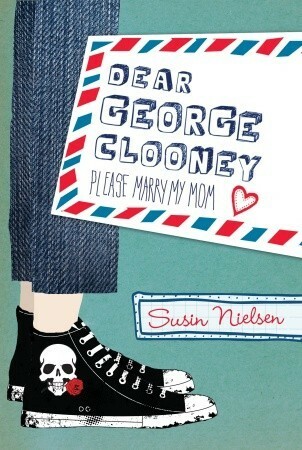 Let us know what’s wrong with this preview of Dear George Clooney by Susin Nielsen. Violet's TV-director dad has traded a job in Vancouver for one in Los Angeles, their run-down house for a sleek ranch-style home complete with a pool, and, worst of all, Violet's mother for a trophy wife, a blonde actress named Jennica. Violet's younger sister reacts by bed-wetting, and her mother ping-pongs from one loser to another, searching for love. As for Violet, she Violet's TV-director dad has traded a job in Vancouver for one in Los Angeles, their run-down house for a sleek ranch-style home complete with a pool, and, worst of all, Violet's mother for a trophy wife, a blonde actress named Jennica. Violet's younger sister reacts by bed-wetting, and her mother ping-pongs from one loser to another, searching for love. As for Violet, she gets angry in ways that are by turns infuriating, shocking, and hilarious. When her mother takes up with the unfortunately named Dudley Wiener, Violet and her friend Phoebe decide that they need to take control. If Violet's mom can't pick a decent man herself, they will help her snag George Clooney. To ask other readers questions about Dear George Clooney, please sign up. To really show you just how wonderful this book is, I would pretty much have to reproduce its entire 229 pages here, which would probably get me sued. So I won’t do that. But I am going to share some of my favorite passages with you. Truth be told, I highlighted almost the entire book, so even picking out favorite passages of my many, many favorite passages has been a chore. I’m going to limit myself, therefore, to passages from the first half of the novel so I don’t spoil too much for you. Beca To really show you just how wonderful this book is, I would pretty much have to reproduce its entire 229 pages here, which would probably get me sued. So I won’t do that. But I am going to share some of my favorite passages with you. Truth be told, I highlighted almost the entire book, so even picking out favorite passages of my many, many favorite passages has been a chore. I’m going to limit myself, therefore, to passages from the first half of the novel so I don’t spoil too much for you. Because seriously, you’ve got to read this book. FOR THE RECORD: I did not mean to send my two half sisters to the emergency room. Now that’s a hook! From the first sentence Nielsen grabbed me by the throat (in the best way) and yanked me into her story. What agent or editor could turn down an opening like that? It’s got everything. It introduces conflict, character, and the tone of the novel all in just sixteen words! Lola and Lucy were so cute, it hurt. They were just under two years old, and they'd inherited the best of their parents' genes: Jennica's thick blonde hair and big brown eyes, and my dad's chin dimple and megawatt smile. Rosie and I hadn't been nearly as lucky in the gene pool lottery. Despite having the same father and a very attractive mother, all we'd inherited was Dad's mousy brown hair and his poor eyesight. He wore contacts; we wore glasses. I'd managed to get his big feet and ears, too, and his bulbous man-knees. All these things looked good on my dad, but transplanted onto a scrawny girl like me, it was seriously unfortunate. We played with the twins for a long time in that sandbox. They adored being with Rosie and me, and I would have loved them with all my heart if I hadn't hated them so much. What Nielsen does next takes real courage. In response to being treated so shabbily by her father, Violet feeds these sweet little baby girls who never did a thing to anyone cat turds. She tells them its chocolate and laughs as they swallow actual poop. Stepmom Jennica freaks out and rushes the twins to the hospital, thusly fulfilling the promise of the opening line. Now I’m not in favor of feeding children poop, but I understand why Violet does it. I suspect not every reader will. Nielsen takes a real chance of turning some readers off in the first chapter. But by doing so, she creates in Violet an immediately sympathetic character I think far more readers will relate to. After this, I was ready to read about anything Violet did. And although eating poop is gross, the twin girls are fine. It was her clothes I couldn't stand. She'd started dressing differently after the divorce papers were signed. Her jeans were too tight, and her shirt was cropped to let her stomach show, a stomach that had had to stretch not once but twice to hold babies. A soft layer of flab drooped over the waste of her pants. To top it off, her belly button was pierced--a belated birthday gift from her friend Karen after they'd had a few too many margaritas one night. As we continued our leisurely descent, I said my little prayer: Dear God, or Allah, or Buddha or Zeus or Whoever-You-Are, please let this one be okay. Please don't let him be a cheater (Jonathan), a cheapskate (Alphonse), an alcoholic (Carl), a creep (Guy), married (Larry), or a general, all-around jerk (Dimitri, Paulo, Jake, Yuri). I said this prayer even though I'm a cynic when it comes to love because I know that my mother is not. You'd think, after what happened with Dad, that she'd given up on men and found contentment in a life dedicated to child-rearing, hard work, and celibacy. But no. Despite a growing list of epic failures, she had this freakish need to have a man in her life. So she dated like there was no tomorrow, always hoping the next guy would be The One. Much of the plot centers around Violet going to great lengths to protect her mother and by extension her and her little sister from her mother’s loser boyfriends. There are some particularly fun sequences in which Violet spies on the men with binoculars. Finally, Violet comes to the conclusion that she will have to find a suitable mate for her mother and stepfather to her on her own. And who better than George Clooney? Yes, that George Clooney. Violet writes Clooney letters and sets out on a mission to convince him to marry her mom. Needless to say, George Clooney shows up and saves the day, the end. Or maybe not. I think it’s best that I leave the plot description here, lest I spoil too much of the book for you. Dear George Clooney, Please Marry My Mom has almost nothing to do with George Clooney, so I can repress my deep sense of injustice as a Batman fan for another day. I’m not even going to tell you if George Clooney shows up in the story or not, and it wouldn’t really matter if he did, because this book isn’t about him. This is a book about families and the constantly shifting definition of what constitutes a family these days. Let me wrap this thing up by stating for the record that I absolutely love this book. It’s everything I want my own writing to accomplish and I’ll be studying parts of it for awhile. Nielsen’s prose is articulate, but not needlessly ornate, and she employs lots of white space which allows the pages to fly by. She’s crafted a great story that is equally hilarious and heartbreaking. Whatever else you do this year, Esteemed Reader, buy this book! fun,enjoyable contemporary book. both fun and funny, I both related and understood the protagonist at times, at the same time she behaved poorly sometimes. I disliked the time jumps that the book had. nice book if you want a quick contemporary read. I had high hopes for this book. Everyone told me this was a charming & funny read & when I was looking through it before reading it, it looked very cute indeed. Let's start with Violet (MC). She was the main reason why I was so disappointed. She was so immature and dramatic (and not funny at all (view spoiler)[ok, except at very specific times when I actually laughed out loud (hide spoiler)]). I know that she was 12 years old (I think) but I still had to remind myself that she was a kid & that's how kids act someday but she was still too immature for me to feel any sympathy for her at all. The next thing that bothered me a bit was the writing style. At first I liked it and thought that it was fun and unique, however as I read more it started to get a little annoying. I'm sure that this book is enjoyable but it was not the read for me, maybe if I had been younger or older with more patient for dramatic brats I would have liked it. Ho ricevuto questo libro dalla casa editrice, dopo aver l'intervistato l'autrice a Mare di Libri. Sono stata felicissima, perchè avevo bisogno di una lettura leggera per concludere Giugno. Mi ricordava me stessa quando avevo 13 anni, visto che ho provato alcune delle cose che succedono alla nostra protagonista: mi ricordo la rabbia, il non voler accettare la situazione. Forse mi sarebbe stato d’aiuto se lo avessi letto in quel periodo, ma leggerlo adesso mi ha fatto pensare alla me del passato con Ho ricevuto questo libro dalla casa editrice, dopo aver l'intervistato l'autrice a Mare di Libri. Forse mi sarebbe stato d’aiuto se lo avessi letto in quel periodo, ma leggerlo adesso mi ha fatto pensare alla me del passato con un po’ di tenerezza, perchè so che il più grosso è passato. Adoro la presenza di Phoebe, migliore amica e figlia di psicologi, che cerca sempre di analizzare i comportamenti di Violet non sempre razionali e le fornisce una spiegazione. Così in qualche modo ho cercato di capire anche io perché mi comportavo così ai tempi. Come anche "Siamo tutti fatti di molecole", pure questo libro l’ho divorato, perchè sono veloci da leggere. What I thought of this book overall (read only this section if you do not want to be spoiled) : I really enjoyed reading this book. I found it very relatable to me. This book is about a girl named Violet who's parents are divorced and she has a baby sister named Rosie who Violet takes care of. Violet struggle's with her mom's countless boyfriends and wishes that her mom would marry George Clooney. Violet was basically me in my childhood, which what I found so relatable in this book. The things th What I thought of this book overall (read only this section if you do not want to be spoiled) : I really enjoyed reading this book. I found it very relatable to me. This book is about a girl named Violet who's parents are divorced and she has a baby sister named Rosie who Violet takes care of. Violet struggle's with her mom's countless boyfriends and wishes that her mom would marry George Clooney. I’m surprised reviewers aren’t comparing this to the Georgina Nicolson series. Dear George Clooney: Please Marry My Mom is a story of how 12-year-old Violet learns to cope with life following her parents’ divorce. But it’s in her not coping that all the absurdosity occurs. To give any details would ruin the surprises. Just know that grief makes people do weird stuff. Violet is no exception. That’s what really resonated with me: how Violet’s (and her mom’s) actions felt so real. She wasn’t nice, I’m surprised reviewers aren’t comparing this to the Georgina Nicolson series. Dear George Clooney: Please Marry My Mom is a story of how 12-year-old Violet learns to cope with life following her parents’ divorce. But it’s in her not coping that all the absurdosity occurs. To give any details would ruin the surprises. Just know that grief makes people do weird stuff. Violet is no exception. That’s what really resonated with me: how Violet’s (and her mom’s) actions felt so real. She wasn’t nice, she wasn’t rational, but she was hurting. Divorce is a family injury, and everyone in a family heals differently and at their own rate from the blast. There were a few cliches and some simplistic writing, but I overlooked that when Violet’s little sister ran around in only her underpants with a colander on her head, which is totally par for the course with 5-year-olds. I’m here for realism, folks. Did this for a book report. Pretty cool book! Dear George Clooney: Please Marry My Mom is not the type of the YA novel I usually get the chance to read because protagonists as young as Violet don't always appeal to me... but I'm so so glad I did read this one! Right from the get-go, as soon as I read the title in fact, I knew I was going to like this novel. I mean, doesn't its name already put a smile on your face? It certainly did for me... and that smile grew on my face as soon as I read the very first line. "For the record: I did not mean Dear George Clooney: Please Marry My Mom is not the type of the YA novel I usually get the chance to read because protagonists as young as Violet don't always appeal to me... but I'm so so glad I did read this one! Right from the get-go, as soon as I read the title in fact, I knew I was going to like this novel. I mean, doesn't its name already put a smile on your face? It certainly did for me... and that smile grew on my face as soon as I read the very first line. "For the record: I did not mean to send my two half sisters to the emergency room." Ever since Violet's director father upped and left their family to live the good life in LA complete with his own new family, Violet's mother has been on the dating scene... with not so great results. So when Violet learns her mother has started dating Dudley Wiener, she decides enough's enough and vows that no one would be perfect for her mother except, you guessed it, George Clooney. Violet is the kind of girl that anyone could easily relate with and some of her antics had me actually laughing out loud. Her Magic 8 Ball conversations were a blast to read and the level of protectiveness she feels for her younger sister and mother, going so far as to even spy on her mother's boyfriends, is just so endearing. She's the kind of character who tells things for what they are and isn't afraid to go after what she wants. Nielsen's writing is fresh and fun, keeping the tone of the novel light yet knowing how to get a bit serious when the time comes. Violet may be a little troublemaker with a snarky attitude (which borders on being cynical at times), but she's still a young girl who simply misses her father and wishes things would be normal again. Dear George Clooney is about a girl Named Violet Gustafson who lives with her mom Inrid Gustafson and little sister Rosey. Ingrid and her husband had a devorce so ingrid is constanly looking for a date.Violets dad lives in Vancover he is remarried to an actress named Jennica and they have 2 twin girls. On the other hand Violet is frusturated by her mom going on dates and she thinks all of them are losers.So Violet and her best friend Pheobe try to hook her up with actress George Clooney.On their way Violet builds relation ship with a boy named John Paul and Ingred gets a date with a guy named Dudley Weiner. The book had a few flaws especailly at the end because it was like a big hole in the story it just ended. But some strenghts is that it was a realistic fiction Susin Neilsen did a great job writing about a 13 year old girl it was like she was the character. I think the book was amazing it was halarious in many parts and Susin Neilsen did a great job writing the story. The book had barely any flaws it was one of the best reads I have ever read and I recomend it to anyone. The lightest work from Nielsen compared to two other titles I had beforehand. Unlike Henry and Ambrose, here we got a female protagonist named Violet, who tried to set her mom up with George Clooney (the title was pretty obvious) because after her dad left Violet's mom for another woman, serial dating her mom's having turned out to be disastrous. So Violet had this idea to find the right man for her mom - George Clooney. Kinda "easy" and too-happy-to-be-true ending, but still I enjoyed the detail The lightest work from Nielsen compared to two other titles I had beforehand. Unlike Henry and Ambrose, here we got a female protagonist named Violet, who tried to set her mom up with George Clooney (the title was pretty obvious) because after her dad left Violet's mom for another woman, serial dating her mom's having turned out to be disastrous. So Violet had this idea to find the right man for her mom - George Clooney. Kinda "easy" and too-happy-to-be-true ending, but still I enjoyed the details Nielsen gave us. The moral of the story is pretty much about how to deal with grief, and to understand that there will always be two sides of a story. Also, to let yourself fall in love. And Cosmo and Amanda from Word Nerd made a comeback! This cute couple had their continuation you surely don't wanna miss out on. I always love it when an author creates a continous universe like what Nielsen does. Guess I should read all of her works to see the whole picture. I finished this in one day! I thought it was a lovely and endearing story! Love how all the main character starts to mature and starts to forgive her family! I liked the incorporation of George Clooney in the book! I learnt that we should not hold grudges against people because that will affect your life more and not to interfere in anybody's love life because only they know who is truly right for them! It has a very "DeGrassi" vibe, and in my universe, that can only be interpreted as being in the book's favor. Violet is a very relatable protagonist, even when (or because?) tends to give into her lesser demons and makes terrible decisions. Read it for its humor, its nuanced characters, and (always a plus), it uses the term "pop" instead of "soda" and repeatedly throws out great phrases like, "hairy eyeball". Mixed feelings about this, mainly because the main character was so incredibly nasty in the beginning. However, I thought there was a lot detail in this short book, and I loved how it was set on Main Street in Vancouver. There were some scenes and instances that were funny. I also loved the ending. It was funny, adventurous, and when i read the part about the Dad cheating on the mom(When he was walking out putting on his belt) it made me want to be there to slap him across the face.There book shows that you have to learn to accept things and they way they work in a silly way.It is a must read book if you want to just chill and laugh out loud. I liked this book, but didn't love it as I got very confused with all of the flashbacks and jazz. I really liked this book. It was easy and short, which i liked reading after Dust City. It was funny and kept me wanting to read more! This book is such a great book if you are looking at books to read, read this one. I guarantee you will love it!!! Violet Gustafson lives with her mother, Ingrid Gustafson and her little sister Rosie Gustafson in an old house with a broken door-bell and run down washer-dryer machine. Violet’s best friend is Pheobe, Pheobe helps Violet with everything from advice on what to say to Ashley Anderson (Their worst enemy) to attending late night stakeouts and spying on her moms boyfriends. Violet’s mom and dad are divorced and her dad moved to L.A with wife number 2, Jennica Valentine, and their twin daughte Violet Gustafson lives with her mother, Ingrid Gustafson and her little sister Rosie Gustafson in an old house with a broken door-bell and run down washer-dryer machine. Violet’s best friend is Pheobe, Pheobe helps Violet with everything from advice on what to say to Ashley Anderson (Their worst enemy) to attending late night stakeouts and spying on her moms boyfriends. Violet’s mom and dad are divorced and her dad moved to L.A with wife number 2, Jennica Valentine, and their twin daughters Lola and Lucy. Ever since the divorce Violet’s mom has been looking for “the perfect guy” but every guy she brings home is far from perfect. Once the 11th guy of the year showed up to their front door for a date with their mom, Violet realized that enough was enough and since her mom couldn’t find a decent boyfriend for herself, Violet was going to set her up with one of the best looking actress out there. George Clooney! Violet just hated all of her moms boyfriends especially the most recent one, Dudley Weiner, from his yard sale purchases and un- funny puns he's just terrible. One day Violet sent George a letter in the mail telling him about her mom and everything that was happening but she got a response with a form letter and 8-by-10 signed glossy of George. Violet decided that she would go to meet George himself which was the perfect idea because her dad who is directing show in the same studio as George is in L.A and would let the girls come to visit. When Violet got to tantamount Studios a lot went down start. Violet came out of there with a broken ankle, a scraped up right side and a almost concussion. In the end Violet ended up accepting the fact that her mom was happy with the Wiener and gave him a chance (thanks to George Clooney) and he actually turned out to be a great guy. This book really showed the life of a young 12 year old girl going through and family divorce. Violet's character is eager to find the perfect guy for her mom since her dad left to live with wife number 2. This book had me laughing because of the things that Violet did to just to make sure her and her family would be happy again. Little did she know that all this time when she was hating all her moms boyfriends it was only because nobody can replace her dad, not even the great George Clooney. This book had great messages. One message was give people a chance because you never know who they are on the inside. This message was really there when Violet hated Dudley Weiner just because of his last name and his looks but she didn't look at him on the inside and he actually turned out to be a great guy. The other thing I loved about this book was that it didn’t drag. A lot of book tend to take longer to explain things but this one got straight to the point so it made the book short and cute.An example of that was when Jean-Paul, Violet, and Phoebe were spying on Dudley. The first time they spied on him they couldn't find anything but the second time they found out something. Other books would make them spy on him like 4 or 5 things before they found anything. Another thing that I really liked about this book is that it was relatable. Some book that are based on young children don't really seem to be that accurate as to the characters would do things that their age group wouldn't really do. The only problem I had with this book was the flashbacks. Sometimes they got a little bit confusing and the flashbacks happened in places where they didn't need to be. Like in one part Violet was having a flashback about what her mom would have done if she had been there. That flashback was really confusing because there were talking about there life in L.A when they immediately switched to there mom. Overall this book was fantastic, I really liked it. The great messages, the straightforwardness, and the relatableness really help to make me enjoy the book! I would definitely suggest this book to young readers! For context, I read this book for my podcast. We wanted to read something between seasons of Degrassi that was Degrassi adjacent and decided to give this book a shot. The premise of "Dear George Clooney..." is brutally realistic. The protagonist, Violet, is reeling from her parent's divorce and the seemingly unfair way that her father can be a big-shot Hollywood director and have a new life with a new woman while her mother struggles to make life work in their home city of Vancouver. This fr For context, I read this book for my podcast. We wanted to read something between seasons of Degrassi that was Degrassi adjacent and decided to give this book a shot. The premise of "Dear George Clooney..." is brutally realistic. The protagonist, Violet, is reeling from her parent's divorce and the seemingly unfair way that her father can be a big-shot Hollywood director and have a new life with a new woman while her mother struggles to make life work in their home city of Vancouver. This framework allows Nielsen's skill set to truly shine in a way that reminds me why I love the episodes of Degrassi that Nielsen has writing credits on. She has a deep understanding of the mind of a preteen girl, more importantly, she understands that it is a dark, complicated place. Violet's anger is entirely understandable, but as a protagonist, she certainly pushes you in terms of her decision making. She lashes out at everybody in her life, some deserving it and some not so much. The first half of the book is a great way to expose these messy dynamics. I am still so pleasantly surprised that Nielsen's understanding of this age group is able to shine throughout the movement of this plot. Unfortunately, with this understanding, comes a part of the narrative that I had a major issue with. This is specifically Violet's habit of bodyshaming every single woman she came in contact with, including her mother. While I understand that a lot of girls her age have these thoughts go through their heads, but it's difficult to tolerate this aspect of the narrative when there is no moment in the story that her behavior is properly called out. It makes this aspect of the plot very difficult to tolerate. It also becomes a bigger picture issue, as I am apprehensive to recommend this book to a middle grade-aged reader, unless there is an adult that is willing to sit them down and reiterate that this type of behavior is unacceptable. It's also not a story that can be particularly recommended for its portrayal of diversity. The only characters explicitly declared as people of color are Violet's best friend, Phoebe, and one of her parents, who are Canadian-American. While Phoebe's family is portrayed positively as a mixed family, Phoebe refers to herself as Violet's sidekick and is constantly content to be at her heels, as opposed to being seen as an equal. It continues to perpetuate the struggle of finding Asian representation in media and the ugly trope that they are passive, particularly to their white counterparts in the story. The second half of the book also suffers from falling into a predictable formula that lacks the heart that the first half has. It also begins to go in certain directions that are so drastically unrealistic to the gritty reality of the first half, it's difficult to buy it at times. Relating to its ability to be believable is that it is a bit dated. The book is from 2010 and it shows. References to things like Obama fistbumps happen. That said, I do think there are very real emotions that happen in this book that do speak to the experience of kids going through divorce, regardless of what year the books come from. Je ne connaissais pas du tout Susin Nielsen et ce fut une très bonne découverte. L'auteur a un style fluide, ce qui rend la lecture rapide et prenante. C'est drôle et pétillant sans tourner au niais, ce que je craignais un peu au début de ma lecture. Elle arrive également à trouver les mots justes pour s'adresser aux adolescents. Le thème abordé n'a rien d'original en soi : le divorce et la séparation des parents, les nouvelles vies des parents après cette séparation, etc. Toutefois, j'ai appréci Je ne connaissais pas du tout Susin Nielsen et ce fut une très bonne découverte. L'auteur a un style fluide, ce qui rend la lecture rapide et prenante. C'est drôle et pétillant sans tourner au niais, ce que je craignais un peu au début de ma lecture. Elle arrive également à trouver les mots justes pour s'adresser aux adolescents. Le thème abordé n'a rien d'original en soi : le divorce et la séparation des parents, les nouvelles vies des parents après cette séparation, etc. Toutefois, j'ai apprécié son traitement. Violette apprend à accepter que sa mère n'est pas qu'une mère et qu'elle a des besoins et des envies qui lui sont propres, même si elle ne les partage pas. Au fil de l'histoire, Violette gagne en maturité même si ce n'était pas forcément gagné au début. Cela a donné énormément de situations cocasses. Susin Nielsen apporte une touche de fraîcheur dans la littérature adolescente. Même en étant une adulte, j'ai passé un agréable moment de lecture. J'ai réussi à me reconnaître dans l'adolescente qu'est Violette mais j'ai aussi réussi à me mettre à la place de la mère de Violette, ce qui a rendu cette lecture encore plus intéressante. Je ne vais pas hésiter à jeter un coup d’œil aux autres ouvrages de cette auteur et j'espère que, lorsqu'ils seront suffisamment grands, mes enfants s'intéresseront également à ces livres. Wir spielten ziemlich lange mit den Zwillingen in der Sandkiste. Sie verehrten Rosie und mich, und wenn ich sie nicht so gehasst hätte, hätte ich sie sicher von ganzem Herzen geliebt. Violet Gustafson ist 12 und lebt mit ihrer kleinen fünfjährigen Schwester Rosie und ihrer Mutter Ingrid in Vancouver in Kanada. Ihr Vater Ian ist Regisseur und hat sich vor rund drei Jahren in die Schauspielerin Jennica an seinem Set verliebt, sich scheiden lassen und ist nach Hollywood g Wir spielten ziemlich lange mit den Zwillingen in der Sandkiste. Sie verehrten Rosie und mich, und wenn ich sie nicht so gehasst hätte, hätte ich sie sicher von ganzem Herzen geliebt. Violet Gustafson ist 12 und lebt mit ihrer kleinen fünfjährigen Schwester Rosie und ihrer Mutter Ingrid in Vancouver in Kanada. Ihr Vater Ian ist Regisseur und hat sich vor rund drei Jahren in die Schauspielerin Jennica an seinem Set verliebt, sich scheiden lassen und ist nach Hollywood gezogen. Ingrid geht seit der Scheidung wieder ihrem alten Beruf nach, sie ist Stylistin und arbeitet in einer Haar-Akademie als stellvertretende Geschäftsführerin, zusammen mit ihren Freundinnen Amanda und Karen, die stets einen guten oder auch weniger guten Rat für sie haben. Violet meint die Freundinnen ihrer Mutter wären wie das kleine Engelchen und Teufelchen. Ian und Jennica haben Zwillinge bekommen welche nun die Halbgeschwister von Violet und Rosie sind. Violet hat schwer daran zu knacken und lässt dies auch Anfangs stark an den kleinen aus. Doch Lola und Lucy sind in ihrem tapsigen Alter nicht nachtragend und so kommt es, das Violet sie auch nach und nach in ihr Herz schließt. In der Schule hat es Violet nicht leicht. Von Ashley und Lauren wird sie als Idiotin 1 bezeichnet. Idiotin zwei ist Phoebe. Phoebe ist die allerbeste Freundin von Violet und immer für sie da. Auch deren Eltern sind sehr modern und freuen sich jedes Mal über Violets besuch. Auch wenn sie stets versuchen sie zu mästen fühlt sich Violet dort sehr wohl. Und dann ist da noch der gutaussehende Jean-Paul. Natürlich würde Violet nicht einmal im Traum daran denken das er sich für sie, die bebrillte Bohnenstange interessieren würde. Doch er scheint ein Interesse an ihr zu entwickeln. Violets Mam erlebt indes eine enttäuschende Beziehung nach der anderen. Entweder sind die Männer Betrüger, verheiratet, Alkoholiker oder sie sind einfach nur daneben. Daneben findet Violet den aktuellen Freund ihrer Mam. Dudley Wiener heißt dieser und schon den Namen findet Violet schaurig und spioniert ihm zusammen mit Phoebe nach. Irgendein Geheimnis trägt er sicher auch mit sich herum. Oder? Doch wie kommt Violet an George Clooney heran. Die Gelegenheit soll sich schon bald bieten, denn Violet und ihre Schwester Rosie sollen ihren Vater wieder einmal in Hollywood besuchen. Aber vorerst muss sie sich noch bei Jennica und ihrem Vater Ian entschuldigen. Was sie schlimmes angestellt hat und ob sie George Clooney überhaupt treffen wird? – lest selbst. Nur damit das klar ist: Ich wollte nicht, dass meine beiden Halbschwestern in der Notaufnahme landen. Warum lesen sich Kinder- und Jugendbücher so schnell ... richtig die Seiteneinteilung und auch die Zeilenabstände sind großzügiger ;) und zack ist ein Buch ausgelesen. Ein tolles Buch für Kids und auch für uns Erwachsene. Ein Einblick in das Gefühlschaos unserer Kids, der hilft sich wieder einmal in ein Kind hineinzuversetzen und über einige Dinge nachzudenken. Es geht unter anderem um die Urangst der Kinder. Das die geliebten Eltern sich trennen, das der Vater sich in eine andere Frau verliebt und die Mutter den Vater durch einen neuen Mann ersetzt. Der Wiener machte es sich auf unserem roten Sofa bequem. Ich setzte mich ihm gegenüber auf unser goldgelbes Sofa. Er lächelte. Ich nicht. Ich starrte ihn ungerührt an. In diesem Buch kämpft die Protagonisten dafür, dass es nicht so weit kommt. Zumindest versucht sie dies bei der Mutter, denn ihr Vater hat bereits eine neue Frau die er kurz nach der Scheidung ihrer Mutter auch geheiratet hat und mit der er Zwillinge bekam. Violet sieht George Clooney als Idealbild, als perfekten Stiefvater für sich und ihre Schwester. Ihrer Mutter hatte viele hoffnungslose Liebhaber, doch sie will nur eines, endlich wieder von einem Mann geliebt werden und sich geborgen fühlen. Violet braucht lange um dies zu verstehen und die Geschehnisse der letzten Jahre zu verarbeiten. Es fällt auf, dass sie stets Sachen sortiert, von A nach B, von klein nach groß und umgekehrt. Es ist sehr interessant in die Gefühlswelt eines Scheidungskindes hineinzublicken. Geschrieben ist es in der Ich-Perspektive und man ist von Anfang an mitten in Violets Gefühlsleben. Das Cover ist knuffig und authentisch. Ein Männlein zum Anknabbern, leider nur ein täuschend echtes Abbild. Die Kapitel beginnen mit großen Ziffern und sind jeweils nicht allzu lang, sodass das Buch für Kids sehr gut zu lesen sein wird. Es ist rasant und flüssig geschrieben. Ein Einblick in das Gefühlschaos eines Scheidungskindes, welches lange braucht um die Veränderungen zu verarbeiten. Ein Kind das alles daran setzt die Liebhaber der Mutter schnellstens zu entlarven und los zu werden, denn schließlich hat sie die Idee ihre Mutter mit George Clooney zu verkuppeln. Ob aus der Idee auch etwas Reelles wird, oder wie eine Seifenblase zerplatzt lest ihr in diesem wundervollen Buch. Mir hat es zeitweise zu denken gegeben und an vielen Stellen im Buch musste ich auch kräftig schmunzeln. Dieses Buch ist für Jung und Alt gleichermaßen zu empfehlen. Als Erwachsener fragt man sich oft, was geht in einem Kind vor. Man war selbst einmal ein Kind aber vergisst mit der Zeit welche Sichtweise auf die Dinge man damals hatte. Dieses Buch katapultiert einen zurück und lässt einen wieder Kind sein. Ihr merkt, ich finde dieses Buch sehr unterhaltsam und interessant. In this book we meet Violet who's struggling to adapt along with her younger sister Rosie to life without their dad at home after he was caught cheating on their mum and left them for her, as well as his new twins. To make it worse her mum then tries dating ending up with a guy called Dudley Wiener, of all names. Convinced he's not right for her mum she sets her mind on splitting them up and finding George Clooney her mum's celebrity crush whom she met once. Along with a fun ridiculous escapade ha In this book we meet Violet who's struggling to adapt along with her younger sister Rosie to life without their dad at home after he was caught cheating on their mum and left them for her, as well as his new twins. Along with a fun ridiculous escapade hardly believable this was a short but still entertaining read about single parents and dating again. We also see Violet rebuilding her relationship with her father after a rather harsh incident takes place. I wish I hadn’t glimpsed the last page of the book in a mindless moment flipping the pages; it would have been more satisfying! “They did not have problems. They had been perfectly, utterly happy.